LIC AAO 2019 Notification: The Life Insurance Corporation of India (LIC) is the largest insurance company in India. The LIC has released the LIC AAO 2019 Recruitment Notification on 2nd March 2019 for the recruitment of Assistant Administrative Officers (AAO) in various branches of LIC across India. Online registration for LIC AAO 2019 has already started and the last date to fill up the LIC AAO application form is 22nd March 2019. Aspiring candidates who wish to join LIC as AAO (Generalist/IT/Chartered Accountant/Actuarial/Rajbhasha) must read the LIC AAO recruitment notification to see if they fulfill all the LIC AAO eligibility criteria. They must also have a clear idea about the important dates, registration process, LIC AAO exam pattern, LIC AAO syllabus, admit card, etc. 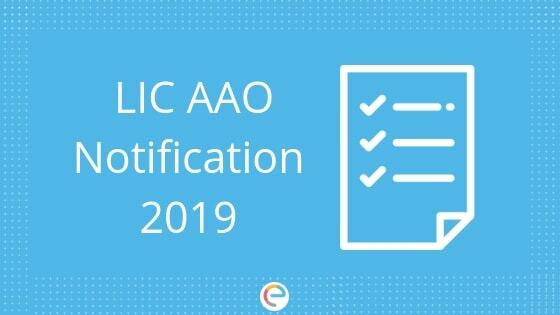 This article provides all the necessary information regarding LIC AAO 2019 notification. Read on to find out. Age Limit: The minimum age of the candidate should be 21 years and the maximum age limit is 30 years. For SC/ST candidates, there is age relaxation of 5 years, 3 years for OBC candidates, and 10 years for Pwd (General) candidates, 13 years for PwD (OBC) candidates, and 15 years for PwD (SC/ST) candidates. LIC AAO (Generalists): The candidate must have a Bachelor’s degree from any recognized university. LIC AAO (IT): The candidate must be a graduate in engineering (Computer Science, IT or Electronics) or have completed his MCA or MSc (Computer Science) from a recognized university. LIC AAO (Chartered Accountant): The candidate must hold a Bachelor’s degree from a recognized university. He should also have passed the final exam of Institute of Chartered Accountants of India and be an Associate Member of the same. LIC AAO (Actuarial): The candidate must hold a Bachelor’s degree in any discipline from a recognized university. He should also have passed Paper CT1 and CT5 plus 4 or more other papers of the exam conducted by the Institute of Actuaries of India/Institute and Faculty of Actuaries, UK. LIC AAO (Rajbhasha): The candidate must hold a Master’s degree in Hindi/English/Sanskrit with English/Hindi/English & Hindi as one of the subjects at Bachelor’s degree level. 1st Step: Go the official website of LIC: www.licindia.com. 2nd Step: Scroll down and click on “Careers”. 3rd Step: Click on “Recruitment of Assistant Administrative Officer 2019”. 4th Step: Click on “Click Here For Apply Online”. 14th Step: Make payment of your LIC AAO application form and take a print out of the application form and confirmation page for future reference. The English Language section is just qualifying in nature. Candidates 20 times the number of available vacancies for each of the categories will be shortlisted to appear for LIC AAO Mains 2019. The LIC AAO Mains exam pattern is tabulated below. Note that it is different for different posts. Here, English Language (Letter writing & Essay)/Knowledge of Language (Descriptive)are just qualifying in nature. Note that for both Prelims and Mains, the medium of exam will be English and Hindi, exce[pt for the Language sections. Based on the marks secured by the candidates in the LIC AAO Main exam, they will be shortlisted for Interview. The Interview will be conducted for 60 marks. For SC/ST candidates, the qualifying marks is 27 whereas, for others, it is 30. Final selection of candidates will be based on the candidates’ performance in both Mains and Interview. As you can see, the LIC AAO exam pattern is almost similar to that of bank exams. So, taking bank mock tests for IBPS and SBI will help you immensely in your preparation. Logical Reasoning Syllogism, Linear and circular arrangements, Coding-decoding, Distance and direction, Puzzles, Inequalities, Classification, Number series, etc. Quantitative Aptitude Basic Mathematical knowledge – Percentage, Average, Profit and loss, Simplification, Time and work, Time, speed and distance, Simple and compound interest, Data sufficiency, Data interpretation, Geometry and mensuration, etc. General Knowledge History, Geography, Sports, Economic and financial news/events/policies, Agriculture, Books and authors, Awards and recognition, History of banking, etc. LIC AAO admit card/hall ticket will be released 22nd April 2019 on the official website. Candidates will have to log in with their Registration Number and Password to download the admit card. The LIC AAO results will be declared on the official website of LIC. The results will be declared separately for each stage of the selection process. Selected candidates will get basic pay of Rs 32795/- per month in the scale of Rs. 32795- 1610(14) –55335– 1745(4) –62315. As per norms, there will other allowances, benefits, and perks along with the salary. The total LIC AAO salary in ‘A’ Class city will be around Rs 56,000/- per month. Candidates preparing for LIC AAO 2019 must be thorough with the LIC AAO syllabus and exam pattern and plan their preparation accordingly. The LIC AAO exam has more or less the same syllabus as any other competitive exams for government jobs, especially banking exams. Taking banking exams will help you in your preparation. Embibe provides banking mock tests for free which will be of great importance in your preparation for LIC AAO 2019. We hope this detailed article on LIC AAO Notification 2019 helps you. If you have any query regarding LIC AAO 2019 Notification, drop a comment below and we will get back to you. Notification kab tak aa skti hai…. Hey, please keep an eye on the official website. Hey, LIC hasn’t released the notification yet. Hey Geethu, the notification is not out yet. Hey Varaprasad, the notification is not released yet. Hey, the notification is not released yet. Last time there was no requirement of minimum 55% in graduation. So from where did you get this information? Please stop giving false information as this could ruin someones career because after reading this someone who doesn’t have 55% might stop his preparations for the LIC AAO exams. So use this medium responsibly. And salary information is also wrong. The revision has happened long back. Are you people really that lazy to find the correct information to post it in your blog? Hey Rohan, How may we help you? It’s our pleasure helping you. Yes, Prashant you can fill the form for IT. Yes, you are eligible for the post. Hi Nandhini, you can select the test centre as per your preference. But, it totally depends on the authority as they provide your selected centres according to the availability of the place. Hi Jashanjot, you can apply for the IT post. Hi Shubhz, as you have not made the payment yet your form is still not submitted. You can go back to your form edit the info required. I have B Tech in Electrical and Electronics, can I apply for AAO IT? Sorry to hear that but we cannot help you as we are not the official authorities. We advise that you go to the official website and appeal your request over there. Kindly contact the official authorities of LIC to get this issue solved. For additional information please go through the official notification by clicking on the link provided in this article. Hey Suresh the admit card will be released on 22nd April 2019. So you can visit the official website to download your LIC AAO Admit card.